(Nanowerk News) Researchers at the Center for Biophysics and Computational Biology and Department of Physics at the University of Illinois at Urbana-Champaign and Howard Hughes Medical Institute constructed a DNA-based nanomechanical device called the "nanometronome". The device is made by introducing complementary singlestranded overhangs at the two arms of the DNA four-way junction. The ticking rates of this stochastic metronome depend on ion concentrations and can be changed by a set of DNA-based switches to deactivate/reactivate the sticky end. Reporting their work: "Single Molecule Nanometronome" in the Feb. 10, 2006 online edition of Nano Letters, Taekjip Ha and his colleagues describe that the device displays clearly distinguishable responses even with a single base pair difference. This may lead to a single molecule sensor of minute sequence differences of a target DNA. As Ha told Nanowerk, "As we watched our DNA device go "tick, tick, tick", we wondered if we could change how often the device ticks. 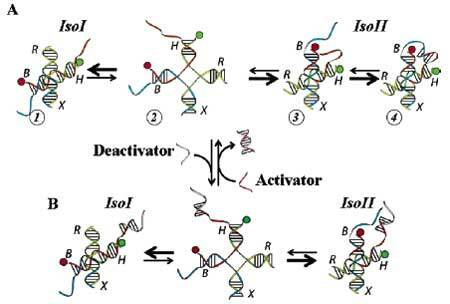 This is precisely what we reported in this work, using additional DNA switching elements. We named it "single molecule nanometrome" because the ticking rate of this ten nanometers sized device is tunable, and the device was observed one molecule at a time." According to the researchers, this is the first demonstration of a DNA-based nanodevice observed at the single molecule level. They learned that even a single base pair difference in the sticky end can be easily detected and single molecular heterogeneity is small enough that even at the single nanometronome level it should be possible to distinguish one base pair difference. Possible applications in the distant future may include the ultrasensitive detection of single nucleotide polymorphism.